On our second day in Sta. 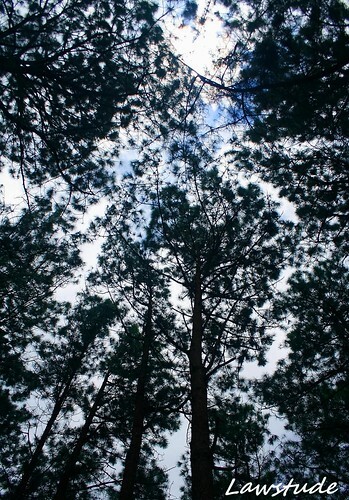 Fe, Nueva Vizcaya, we headed to Malico Pine Forest which is part of the Kalahan Reserve. Ferdz has gone there before on a photo-docu assignment about Carbon Trading and he has good reviews about the place. Barangay Malico is about 10 kilometers from Imugan so we rented a passenger jeep to take us there. The ride was mainly uphill on a narrow, unpaved road. We even came across a jeep that is literally on the edge of a cliff with just a young tree supporting it from falling. The jeep could only took us to Barangay Salacsac because the road became impassable. We then, trek for about thirty minutes to Malico Pine Forest. It was still noon when we arrived so the skies are still clear and we can still have a decent view of Nueva Vizcaya and Pangasinan towns from there. 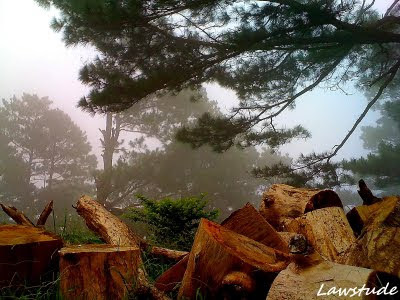 But as time passes, fog envelopes the place and it felt like I was in Baguio back in the eighties. Definitely one of the freshest and coolest place I have been to this year. The last two shots were taken using my IPhone so the resolution ain't that great. Also, today is the birthday of Ferdz, so Happy Birthday Ironwulf and thanks again for inviting me on this trip. Galing ng shots, super. Bow talaga ako sa iyo. What camera do you use aside from the iphone? I like the first two photos. patikim ng mary jane. hehehe Happy birthday kay Ferdz! Belated para sau. The photo looked good to me and it gave a kind of mysterious feeling about the forest. galing. love all the photos. sana makarating din ako jan. 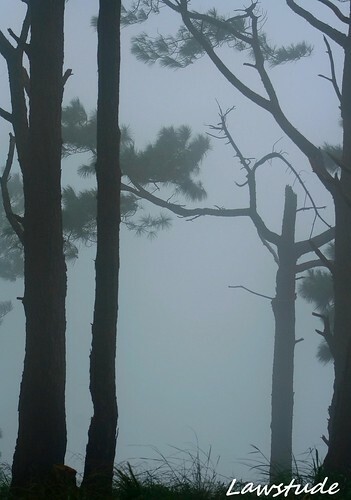 Very dreamy view of pines trees amidst the fog! It must be fun shooting with fellow photo enthusiasts. It would be great to spend time with people who share the same passion - travel and photography. Hi Norman! The pictures are excellent as always, but your first is absolutely awesome!! Maganda ang mga shot bro. Medyo kakatakut lang ang dating ng fog. Awesome. Really vivid shots in here. Mukhang malamig nga jan. Hapi birthday Ferdz. Beautiful photos! Para tuloy gusto kong sumakay ng eroplano (o bus) at pumunta dyan! Happy birthday to Ironwulf. ohhhh, so it was ironwulf's birthday, not yours? or did you have birthdays consecutively? i'm confused. love the fog. it's so very "silent hill"-like. and it's not in baguio! @ sheng - i use canon dslr eos400d. Belated Happy Birthday to you and Ferdz! Wow! Definitely looks like an interesting place to visit, both Imugan and Malico. Ganda talaga ng Ecija. Thanks for sharing. Awesome scenery. Thank you for sharing. I will definitely go back here to see more. I just love the foggy atmosphere. We usually have that weather here specially during this time of the year. The first photo is just too lovely with the blues and the clouds picking from the trees. LS: Very cool on this foggy trip, nicely captured. But what catches my attention is the picture of the St Dominic's Cathedral in Bayombong because I'm seeing the church's picture from other people's blog. Actually, the tower of the church is a re-built after the 1990 devastating earthquake. It was rebuilt sometime around 1993 and I am proud to be a part of rebuilding the structure of the tower...BUT, even it's a new structure, it has to retain the old look of the church.